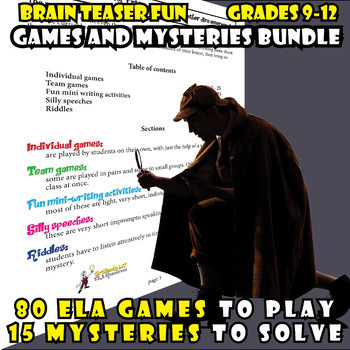 80 fun, educational games are crammed into the vibrant pages of this resource. There are games for individuals, team games, mini writing activities, silly speeches and riddles to solve. The preview provides peeks into most of the sections. Please also listen to my video for a two minute overview. The resource includes a bonus card game: literary devices SNAP! It can also be purchased separately. When even your most academic students are thinking more about the weekend or holiday ahead than about the finer points of your brilliant lesson, then bring on these educational games! Here is a list of just the individual games. All games have an answer key! Most involve speed; the first person to finish is the winner. Non-rude parts of the body that have three letters. Top 10 lists, such as biggest countries in the world, the fastest animal in the world, most popular food and drinks, etc. Literary terms bingo. It includes the bingo card for students, 54 questions on terms, and a 3 page definitions list to be given to students for review before the game commences. This is the only game which requires a few minutes of photocopying beforehand. It can also be bought individually. Mini-mysteries are not only fun brain teasers, but also practice listening and inferential skills. They are carrots for the end of the day, or even bell ringers. Alternatively, early finishing or talented students could read the mysteries on their own. The most obvious methods of using these 15 tales are to read each one out loud or to show them on your screen. The students then guess the solutions. If you want them to work a bit harder, they could record and explain their guesses on the included worksheet, and write their own story, using the guidelines. The solutions are on a different page from the story and its question, so that students cannot see them accidentally; that would really spoil the fun! Meet the renowned Caker Street detective, Sherjock Foams, and his friend Dr Jotson; teachers Noah Lot and Ms Teri; wild teenager Robin M. Blind; riddler Chris P. Bacon; and sneaky Liam, his grandmother, Anne Teak, and his shrewd cousin Becky. 15 vividly illustrated mini mysteries. An optional tips page, explaining the most common mystery/ riddle clue types. An optional working page, so students can write down their guesses, and keep a tally of how many mysteries they got right. A mini-mystery writing advice sheet, to guide students in writing one of their own. A simple teacher rubric to mark the students’ own mini-mysteries. Here are some more of my fun high school ELA resources that you could take a peek at. Debate ANY novel or play! I hope that your classes experience as much hilarity from these mysteries as mine have done! If you have any questions, comments, or suggestions about this product - or any other product in my store - please write to me at brilliantlylit@gmail.com. I would love to hear from you! Thanks so much for checking out my resources! I have not been selling on the TpT website for long, but intend to add more resources soon. Click HERE to make yourself a follower. You will receive notification of new resources and SAVE 50% off for the first 48 hours. If you purchase this resource, I would be very grateful if you could review it afterwards. Doing so will earn you TpT credits to spend on other resources, so it is a win-win.